Fifth disease, also known as erythema infectiosum, is a common viral infection among school-aged children. It is caused by parvovirus B19, which spreads through direct contact with fluids or mucus from the nose or mouth of an infected person. Fifth disease causes a bright red "slapped cheek" rash that doesn't appear until an infected person is no longer contagious. Fifth disease usually is a mild illness, and some people who are infected may never realize they have it. 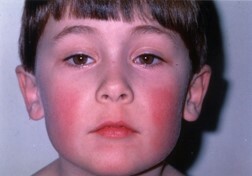 Outbreaks of fifth disease typically occur in late winter and early spring. When outbreaks occur among schoolchildren, 10% to 60% of susceptible children may develop symptoms. Parvovirus B19 infects humans only and is not the same as the parvovirus that infects dogs.